HBL and HBL Foundation have been supporting IHN in its mission of providing free and quality healthcare to the undeserved people since 2008. During the meeting, HBL leadership expressed its interest in enhancing HBL’s contribution towards creating meaningful impact on Pakistan’s healthcare sector and to further increase it’s collaboration with IHN. 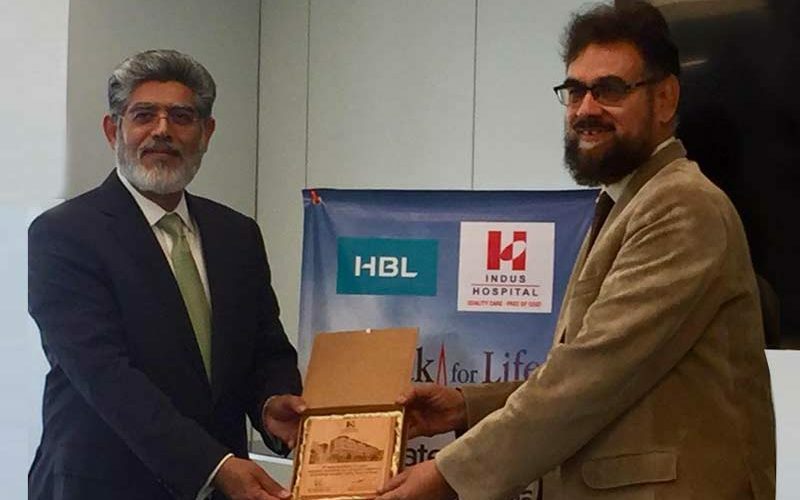 HBL’s senior management donated to support the cause and encouraged their team to generously support Indus. They elaborated that HBL is fully committed to make conscious efforts towards corporate social responsibility intiatives and is willing to give back to the country and communities it serves. They also assured that HBL will continously work with IHN in uplifting the marginalised segments of the society. This cooperation will help Indus in forwarding the cause. Brick for Life is Indus Hospital’s expansion campaign which was initiated to help collect donation for the expansion of the Korangi Campus. The Indus Hospital started functioning with 150 beds in 2007, however, due to the growing number of patients, the hospital has been constantly increasing its capacity. Currently it has 300 beds which are insufficent to cater to the needs of patients coming from every nook and corner of the country. The hospital is underway another expansion and aiming at increasing its capacity by 1000 plus beds.